Not only is October 11th a Feel Good Friday, the UN has declared it International Day of the Girl Child. 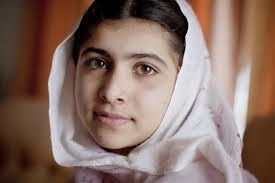 So let's talk about a girl who's been in the news again lately, Malala Yousafzai. An advocate for the education of girls in Pakistan, she was shot in the head by the Taliban in an effort to silence her. She was 15 at the time. One year later, not only has she made an incredible recovery but she has also created the Malala Fund to support the rights of girls around the world to go to school and she was nominated for the Nobel Peace Prize. She was recently on the Daily Show to promote her book, "I Am Malala: The Girl Who Stood Up for Education and Was Shot by the Taliban". If you haven't seen it yet, you can watch the interview it here. On her 16th birthday (July 12, 2013) she gave a speech to the United Nations Youth Assembly which you can watch here and her interview with Christiane Amanpour of CNN will air this Sunday at 7pm EST. Watch the interviews, buy the book or like the Malala Fund's Facebook page. If you're interested in learning about more organizations focused on girls, including the Global Women's Water Initiative - the stop on Inspiration Safari - you can read this article from the Huffington Post.